This is National Pollinator Week and what better time to post some bee wisdom from Cooperative Extension apiculturist (now emeritus) Eric Mussen? 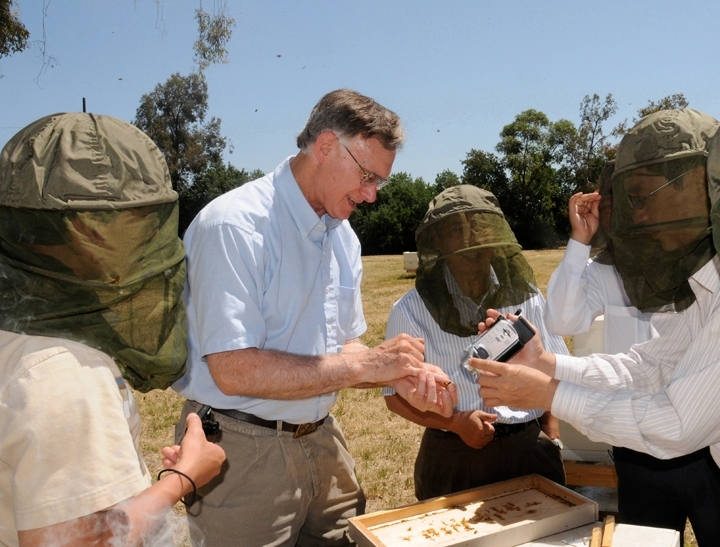 Based in the UC Davis Department of Entomology and Nematology, Mussen completed 38 years of service last June and is nationally and internationally known as "the honey bee guru." "Most of us take pollinators for granted. That's a key reason why Gov. 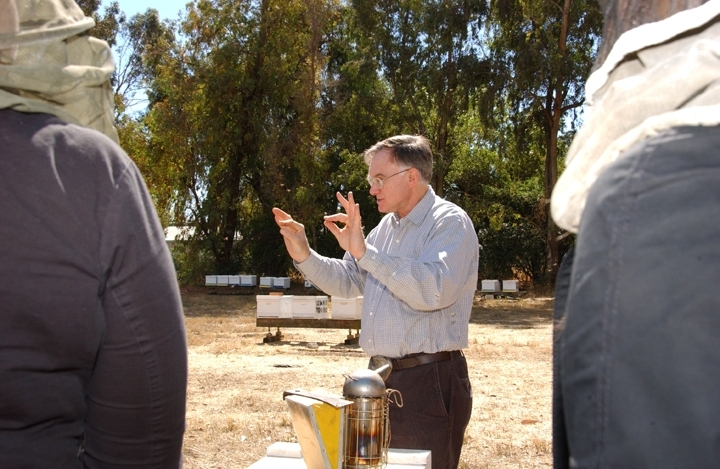 Jerry Brown has joined other governors throughout the country to celebrate June 15-21 as National Pollinator Week. It's a time to appreciate what bees, butterflies, beetles, bats and other pollinators do. Honey bees and native bees are especially important for the pollination of our agricultural crops. Without them, we'd be pretty much confined to a boring, unappealing and non-nutritious diet of wheat and rice." "Many beekeepers can't keep their colonies alive, no thanks to pesticides, pests, parasites, diseases, stress and malnutrition. We humans negatively impact our bee populations by converting their natural habitat to an unnatural habit (for them): airports, highways, housing projects, shopping malls, and parking lots. Food sources and nesting habitat for pollinators continue to shrink. Use of herbicides reduces what little bee-food resources are left. 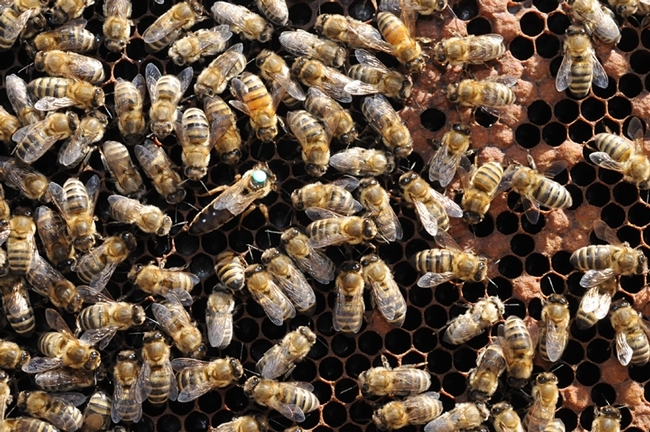 In some cases, pesticides kill insect pollinators outright. In other cases, chronic exposure to sublethal doses of pesticide residues disrupts normal development of immature pollinators." Mussen asks that we all "consider planting bee-attractive flowers that bloom well beyond late summer into fall. 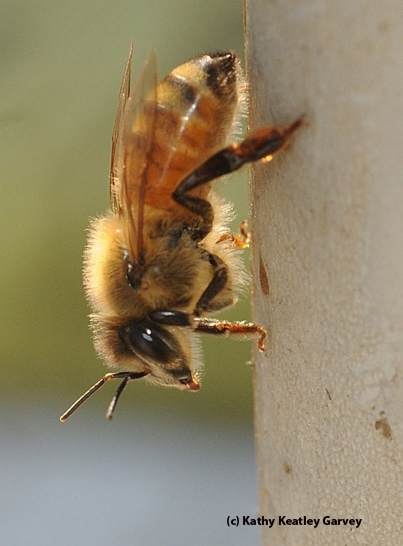 The colonies require good-sized populations of well-fed bees to survive through winter." "Also, we should consider restricting the use of pesticides to those times that pollinators are not attracted to blooming flowers or weeds. This would prevent acute bee kills, contamination of stored pollens, and unnecessary use of bodily energy for detoxification of pesticide residues." He adds: "It's good to see that the Almond Board of California--with the help of an advisory committee comprise of scientists, beekeepers and growers--generated a packet of materials: “Honey Bee Best Management Practices for California Almonds.” The impetus: a large number of colonies suffered serious pesticide damage during the 2014 almond pollination. The packets contain an 18-page pamphlet about honey bees, their management, and their protection. Included, as well, are two heavy-duty, laminated “Quick Guides” (in English and Spanish) to be taken into the fields as reminders of best management practices. You can request the free packets by contacting the Almond Board at (209) 549-8262 or downloading the document at http://www.almonds.com/growers/pollination. The information in the packets pertains equally well to most other crop situations." "Our bees," Mussen says, "deserve the best." You are currently not signed in. If you have an account, then sign in now! Anonymous users messages may be delayed. Honey, Let's Go Taste Honey! Agriculture and Natural Resources, University of California. • All contents copyright©2019 Regents of the University of California. All rights reserved.